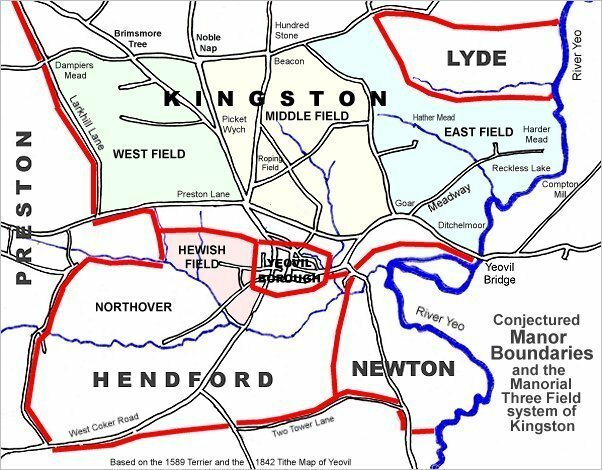 The 1589 Terrier, in referring to the boundaries of the great Middle Field of Kingston Manor, noted Milford several times as follows ".... From Gore Corner next the Highway to Goldcroft Lane end and up to Milkford Lane end.... In John Vicars close at Milkeford Lane end.... In Thos Phelps Close at Milkeford." The 1633 Survey of Kingston recorded "John Bachiler holds by indenture dated 12 Oct 20 1622 granted by Edward late lord Stourton, Sir William Stourton now lord Stourton and dame Frances his wife, and in consideration of a former lease determinable on the death of John and a fine of £10, 2½ acres of pasture sometime part of the demesnes lying in the fields of Kingston at a place called Milkeford [Milford], (except all timber trees and liberty to carry them away), to hold for 99 years and the lives of his sons and daughter, John Batchiler mort, Richard Batchiler 34 and Mary Batchiler 27. Rent 16d." The surrender of a lease dated 30 March 1665 between Sir William Stourton and Thomas Marsh of Kingston, joiner, referred to ".... All those 2½ a pasture in the Lord’s domain of Kingston Fields called Mileford lately enclosed within the Manor of Kingston for 99 years on the lives of Thos Marsh the Elder, Thos Marsh the Younger, George Marsh and Marie Marsh." 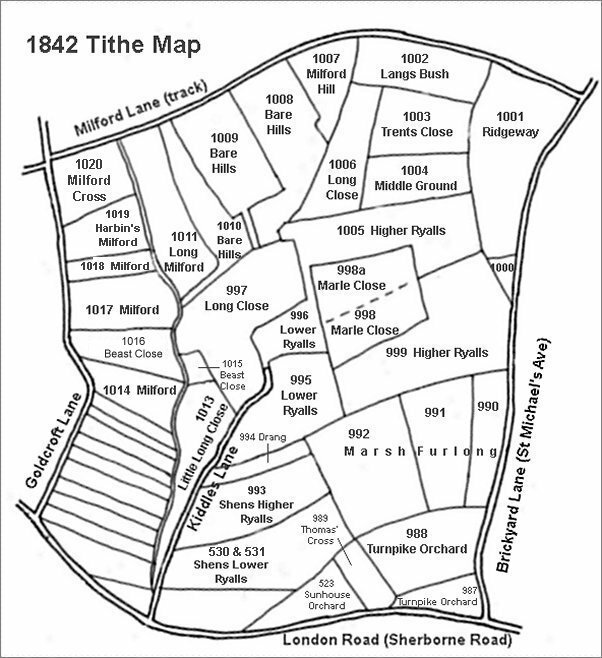 By the time of the 1842 Tithe Map the former field had been split into several parcels; the most northern was Harbin's Milford (1019) and identified separately in the 1846 Tithe Apportionment. 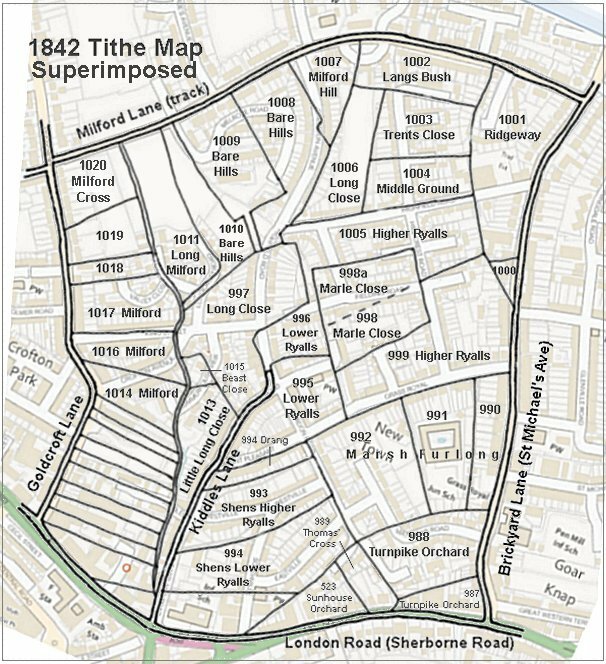 Parcels 1018 to 1014 were all part of the former Milford - bounded on the west by Goldcroft Lane (today's Goldcroft) and in the east by Milford Brook. Parcel 1014 was recorded as pasture of 4a 0r 1p and Parcel 1017 was recorded as pasture with an area of 3a 0r 15p but the other two Parcels were not recorded. 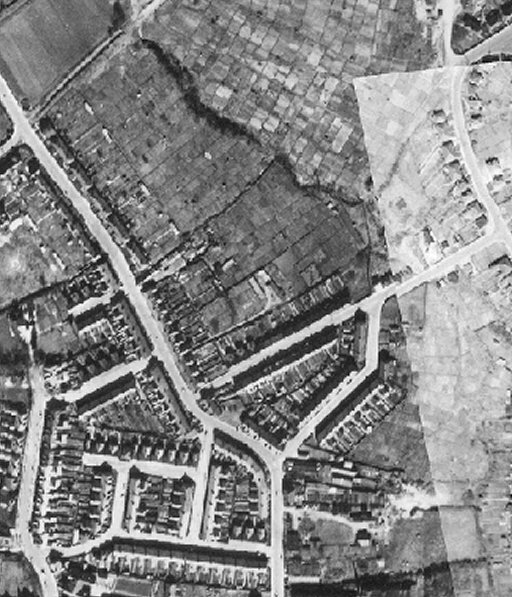 As seen by the aerial photograph of 1946 below, those parts of Milford not built on with King Street and Crofton Avenue were used as allotments at this time. Today the site of the former Milford field is occupied along its western flank by the houses and gardens of Goldcroft while the eastern side is occupied by the northern end of Portreeve Drive and pretty much the whole of Valley Close, King Street and Crofton Avenue. The 1946 aerial photograph with Goldcroft running from top left to bottom centre and Milford Lane at top right. Milford Brook is delineated by the wavy dark band of trees lining its banks and running from top left of centre towards centre right. King Street cuts across the centre right of the photograph from Goldcroft to Highfield Road at top right, with Crofton Avenue running off it.